Welcome! I bought this house as a foreclosure in 2011 and I've spent the past few years turning it into our home. There's still plenty of projects left to-do (does is ever end?! ), but I'm happy with the progress so far! This is the front door/entry area. 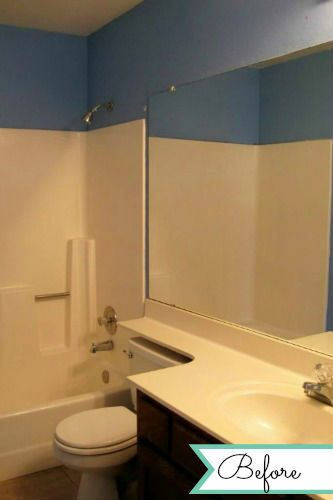 There’s really nothing special about this space and that two-tone wall color is not a great look. This area is still a work-in-progress (like the rest of the house), but at least that horrible paint job is gone! I’ve also added a couple pieces of furniture over the years, including my grandma’s entry/hall tree and a gray bench (from Amazon). I also hung an antique window and cotton wreath and added a rug. Although the rug keeps getting bunched up from the dogs, so I don’t know how long it’ll stay. Still on the to-do list: replace the light fixture and remove the blinds/replace with curtains or frost the windows. 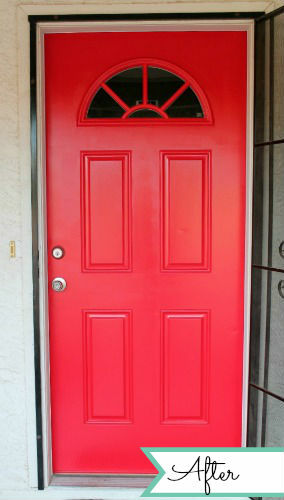 I also painted the front door red (Geranium by Behr). I fell in love with this house because of the living room/dining room/kitchen’s open floor plan. This is the living room area. I love how bright and open it is. 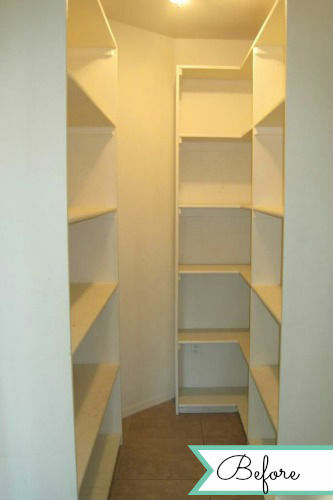 I didn’t love the two-tone wall color or the dated built-in wall unit. A couple days after closing we my ex-boyfriend took a sledge hammer to the wall unit. 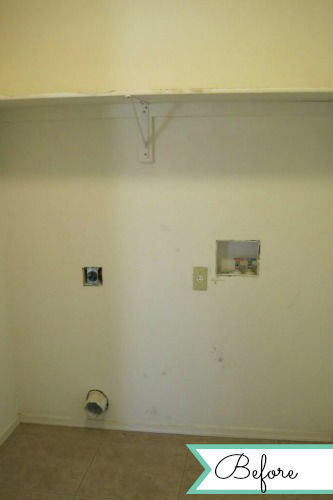 After it was removed my mom and I patched/painted the wall and I hired a handyman to replace the missing tile. Once the baseboards are installed you’ll never know the wall unit existed (yes, it still doesn't have a baseboard after 6+ years...). I bought an entertainment center from IKEA to fill the wall. Even though we had a few assembly mishaps, I love it (and it takes up way less floor space than the previous entertainment center). 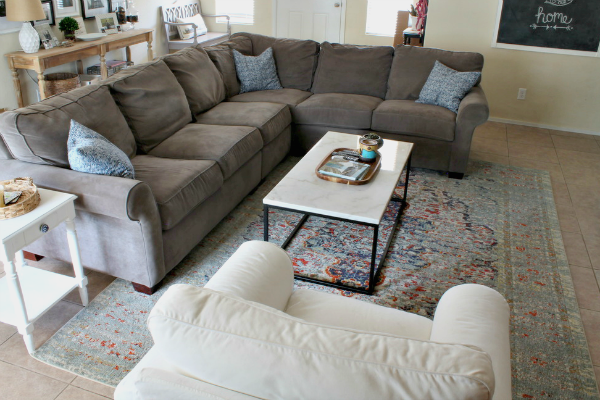 I also added: a new sectional, a bold rug, an apothecary cabinet, a coffee table, and a thrifted chair. 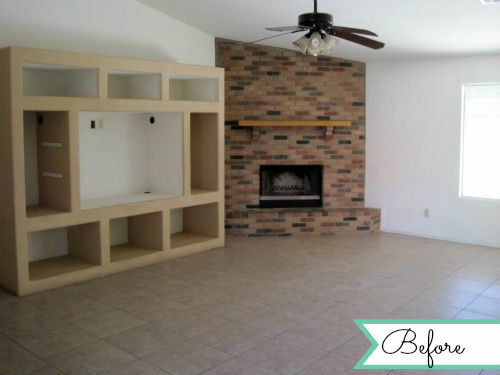 My plans/shopping list for the living room include: replace the missing baseboard (behind entertainment center) and some general styling. 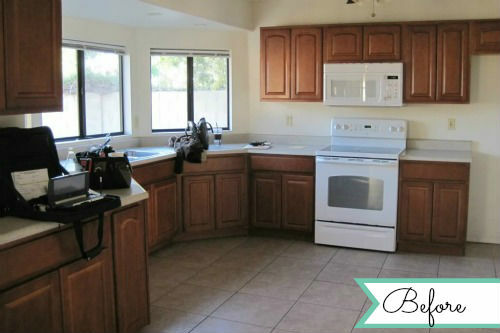 The dining room is between the living room and kitchen. 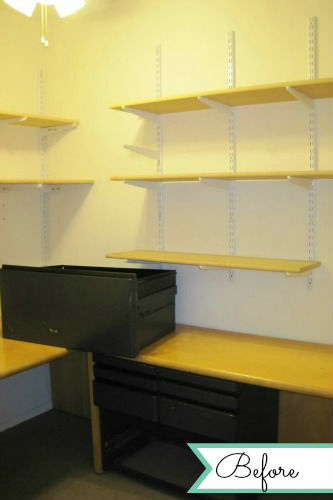 I don't have a before picture, but just imagine this space with nothing in it and mini-blinds on the back door. As part of the spring 2015 One Room Challenge, I updated this space with new furniture, a no-sew roman shade, and wall-mounted cup rack. You can see the full reveal here. I love my large, open kitchen. I think the previous owners had recently installed the kitchen cabinets. They were in great shape and really clean. The house didn’t come with a refrigerator and the dishwasher didn’t work, so first order of business was buying appliances. My awesome parents bought me the refrigerator as a house warming gift and I bought myself the dishwasher. 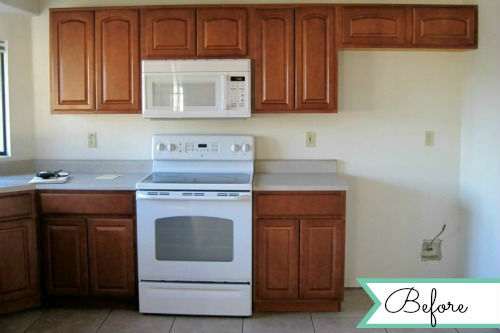 I eventually replaced the microwave and stove to match the other stainless steel appliances. 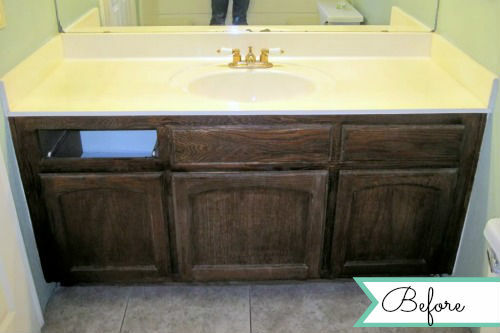 I also added hardware to all of the doors and drawers – one of my favorite projects to date. 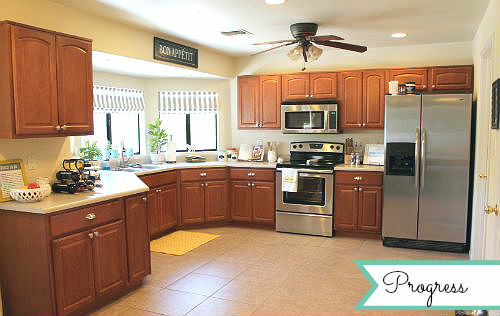 You can read a recap of all the kitchen projects here. 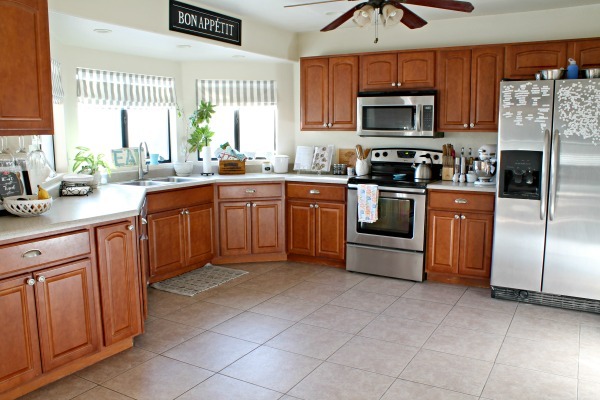 The biggest project left on my kitchen to-do list is replacing the counters and tiling the backsplash. Let's head down the hallway. Not much has changed in the hallway except for the linen closet. I painted the dark, dated wood white which freshened up the whole area. I still need to replace the hall light and change out the dated, gold door knobs. 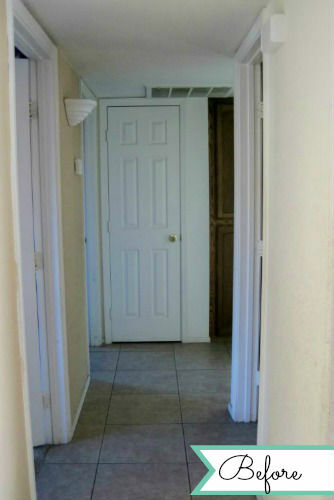 First door on the right is the guest bathroom - formerly known as “The Crime Scene”. 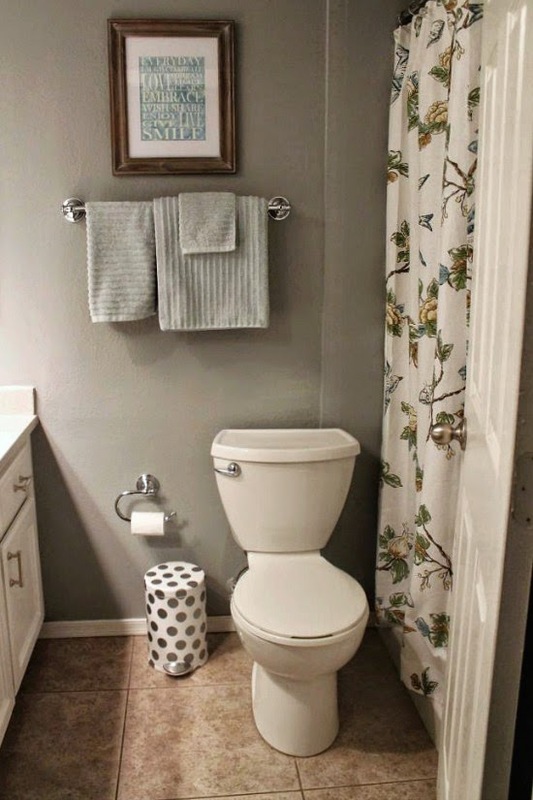 I have no idea what those stains are…I don’t think I want to know. 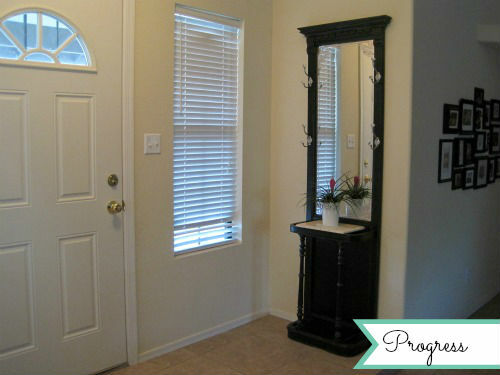 My first year in the house I gave this room a new coat of paint and added all new hardware and accessories. 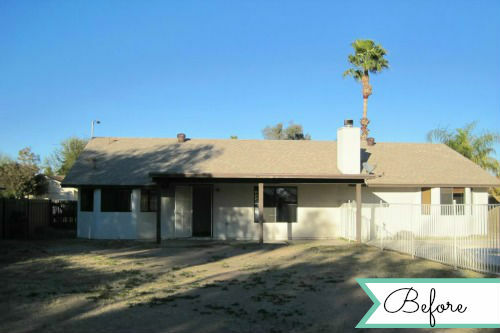 You can see the complete makeover here and the budget breakdown here. 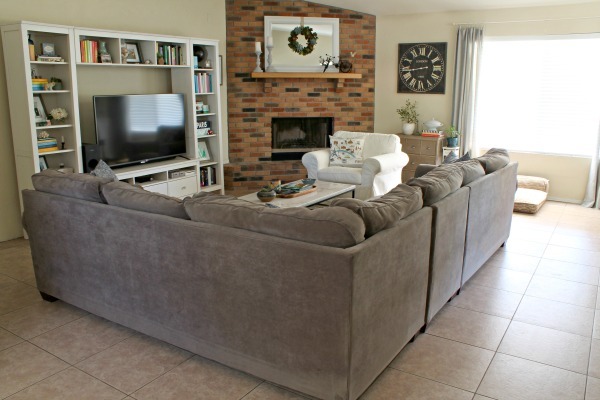 I loved it at the time, but last fall I decided that I was ready for something lighter and brighter, so I refreshed this room as part of the Fall 2018 One Room Challenge. 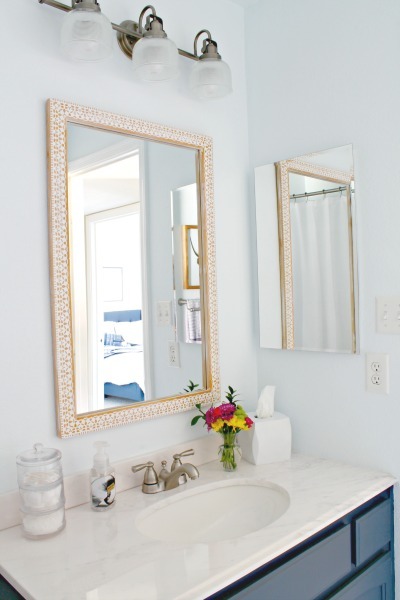 I'm OBSESSED with how it turned out (you can see the complete reveal here). 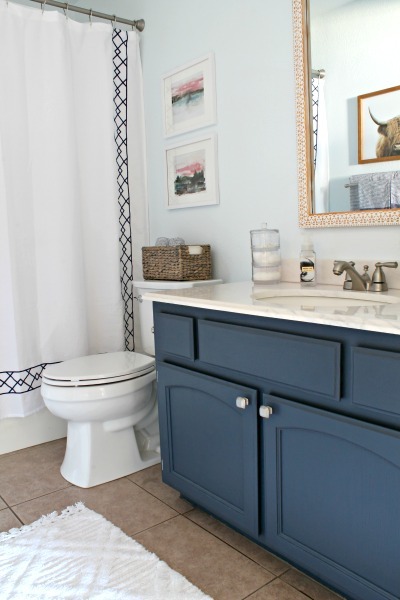 That navy color on the vanity is officially my favorite color! Across the hall from the bathroom is the first bedroom. 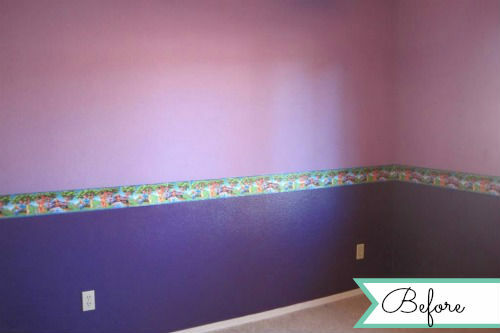 Two shades of purple and a Winnie the Pooh wallpaper border…ugh! We tore down the Pooh border and primed over the purple. 2 coats of Behr White Clay later, the purple walls are a distant (horrible) memory. 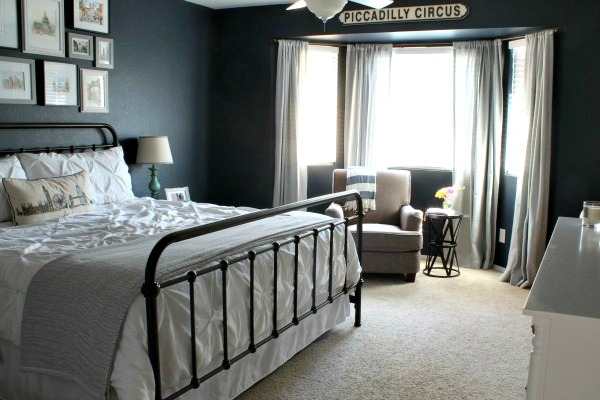 A few months later I painted stripes on all four of the walls and "sewed" a pair of navy/white chevron curtains. I also added a sleeper sofa from Craigslist and an end table from an antique store. 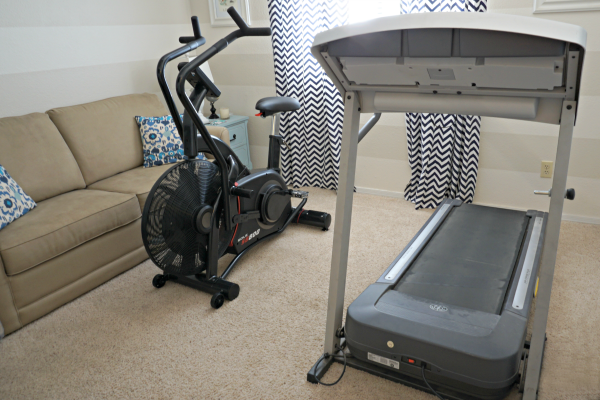 This room was originally an office, but we just changed it to a home gym. I miss my cute office (you can see the room as an office here). 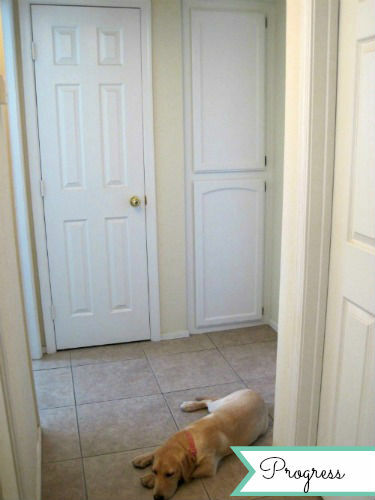 One door down is the guest bedroom. Get your sunglasses for the “before” pictures! Yes, it is half hot pink and half bright blue. 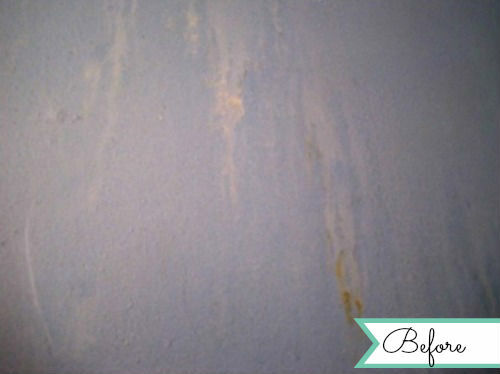 When I first moved in my mom and I primed this baby like nobody’s business and then painted it Behr’s Ice Cube. It stayed that way for a couple years until the Fall 2015 One Room Challenge (see the full reveal here). The room stayed like that for the most part until the Spring 2018 One Room Challenge. I'd been talking about upgrading the bed to a queen-size for years and that seemed like the perfect opportunity for a full refresh. I love how it turned out! You can see the full reveal, source list, and budget breakdown here. Across the hall is the master bedroom. 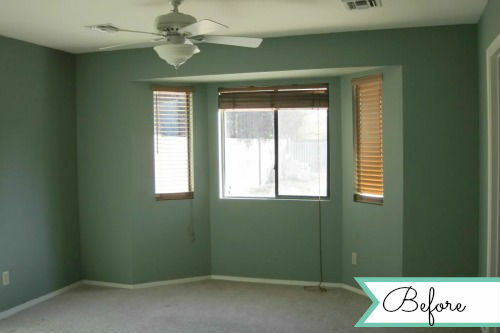 I loved the size of the room (and closet) and the bay window immediately. The green color...not so much. 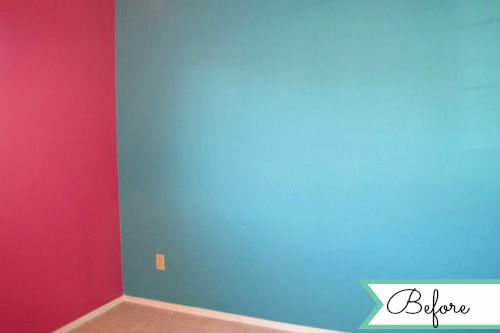 We painted this room the day after I closed on the house (Secret Locket by ColorPlace). I upgraded to a king-size bed, added a couple yard sale night stands and an upholstered headboard...amd it stayed that way until Fall 2015. 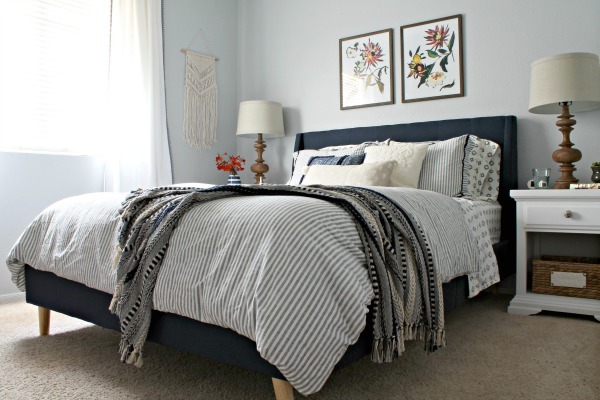 In September 2015, I re-painted the room navy and started replacing all of the furniture (new bed and new nightstands). After that progress stalled for a bit, but then I decided to work on the room during the Spring 2016 One Room Challenge. The room is mostly finished now (and I still LOVE the wall color), you can see the reveal here. My dad is really handy so he replaced the toilet, faucet, and light fixture for me when I first moved in. He also updated the nasty beige outlets/light switch to clean white ones. 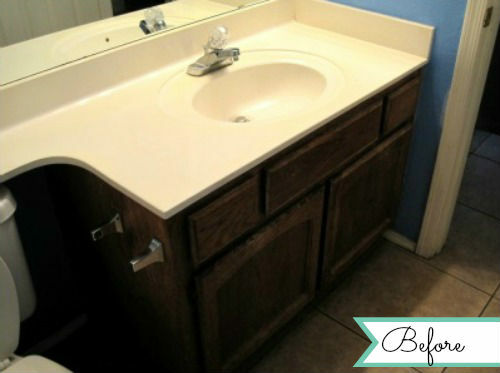 Over the next couple of years I replaced the medicine cabinets, added a towel bar, and replaced the missing baseboards. 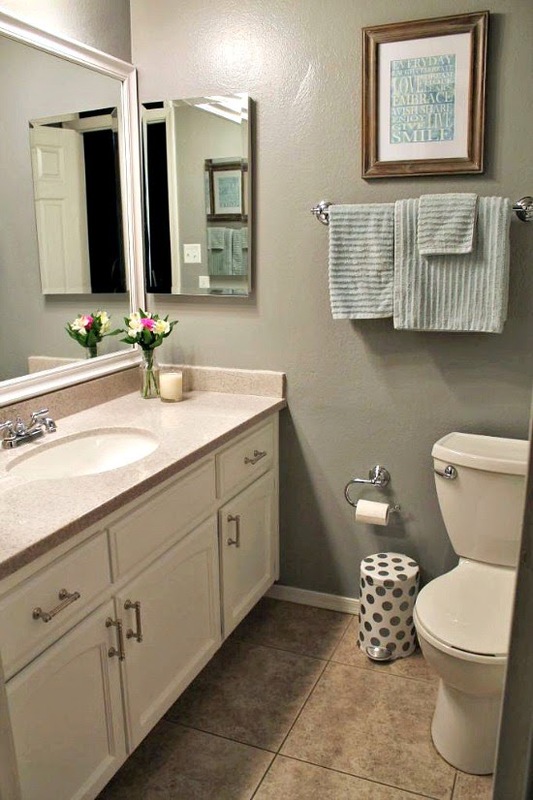 For the October/November 2014 One Room Challenge I painted the walls, replaced the missing drawer and painted the vanity, replaced the countertop, framed the mirror, added new towels, artwork, and shower curtain. You can see the full reveal here. Back through the house, next to the kitchen, is the laundry room. The house didn’t come with a washer and dryer, but luckily my ex-boyfriend already owned a nice set (and I got to keep them in the breakup). I painted the walls Cumulus by Behr and painted a fresh coat of white on the trim, doors, and shelves. 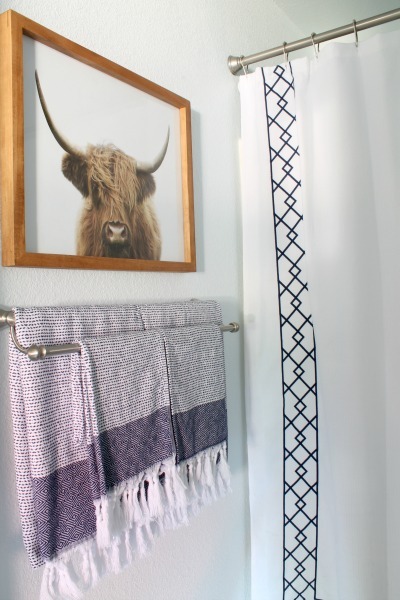 I added some baskets from Michael's, a set of giant safety pins from Ballard Designs, and 'Laundry Today or Naked Tomorrow' vinyl from Etsy (see the most recent laundry room post here). I still want to build a counter across the top of the washer and dryer, but that's the only big project left in here. Next to the laundry room is the pantry. 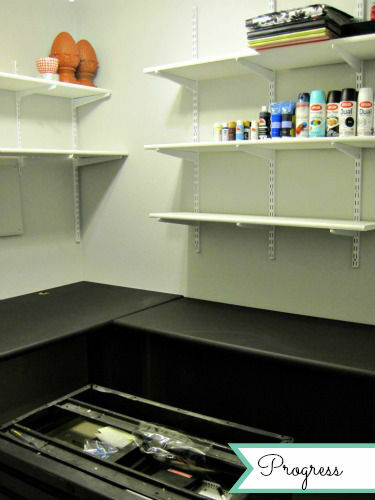 Now this is a pantry for stockpiling! I painted the walls with paint leftover from the guest bathroom makeover and updated the shelves with a fresh coat of white paint. I updated my food storage to glass jars and crates. I also replaced the light fixture. 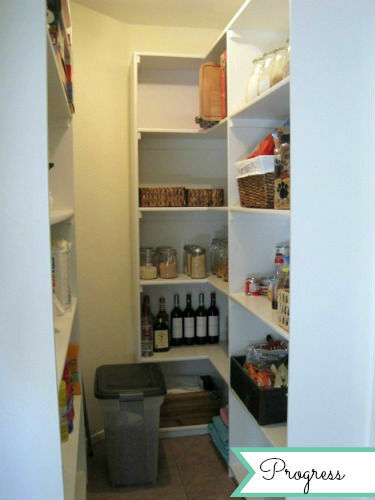 Just off the pantry is another room. It’s a tiny little office that I’m using as my craft room. I painted the walls (Sterling by Benjamin Moore) and painted the shelves white (just regular off-the-shelve bright white). I also painted the desk with chalkboard paint! I’m still working on organizing and putting everything back in the room. I also have two chairs that I need to re-upholster to use in this room. Now let’s head out back. This is the backyard. It’s freakin’ huge, but was just dirt and weeds when I moved in. This picture actually makes it look better than it did in real life because the weeds had just been cut down. 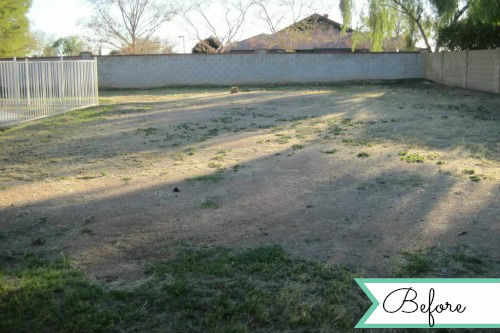 And here’s the back patio…way too small for such a large yard. During the summer of 2012 I hired a local landscape/concrete company to extend the patio. They extended the patio out and also poured concrete along the side of the house. 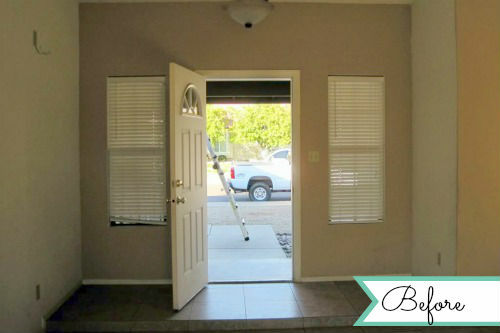 I love how it turned out…and it’s nice being able to take out the trash barefoot! And finally, after talking about landscaping the yard for 5+ years, I hired a local landscape company to redo the entire yard. You can see the full reveal here. Lastly, the swimming pool! It’s expensive to upkeep, but it’s so much fun swimming with the dogs. Ringo and Abby are obsessed with the pool. Ringo wants to swim every day during the summer. 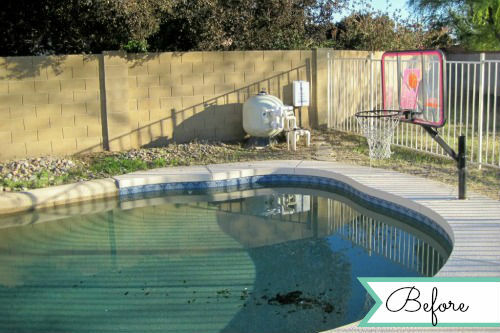 The pool area was also landscaped with the rest of the yard and I love how it turned out! It's going to look so lush once the plants grow a bit!